I thought I’d start swatching the China Glaze Summer Neons collection with my favourite (at least from just looking at the bottles): Pink Plumeria*. 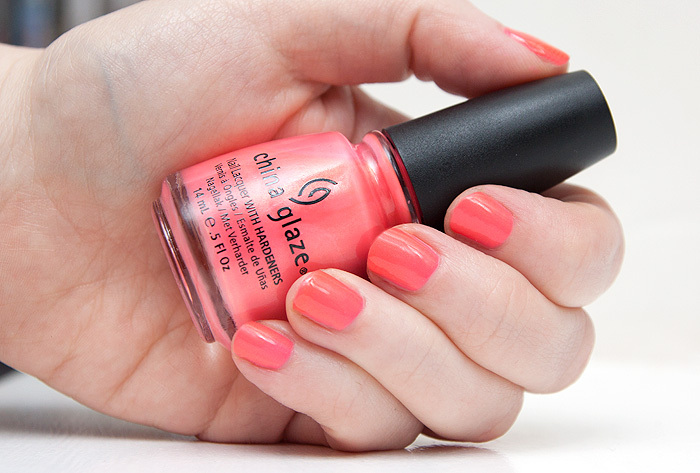 It’s a bright coral which definitely leans more towards the pink side of the spectrum, making it an excellent choice for those of us who might usually struggle with the warmth in traditional coral shades. Pink Plumeria, to my eye at least, carries a really subtle duochrome – I’m not sure if this is intended, or is simply a result of the golden shimmer packed within. You can see on the nail tips, there’s definitely more golden tones than toward the base of the nail bed. The formula on this one was ok… a bit prone to pooling, so definitely paint this one on in thinner strokes. This is going to be such a lovely pedicure shade too, I’m feeling the love for this one! I definitley need this on my toes! Pretty! As lovely as this is, it is really doing nothing for me today. I think I go off of pinks a little in the Summer, they just seem to be everywhere. Oh, and kudos on the duo spotting, how lovely!